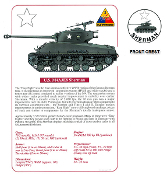 WWII US Sherman tank (M4A3E8) with 76 mm main gun - 1st Armored Division. Small crest on front, large design on back. Large design features historical text and tank specifications. One-sided design has large image on front, nothing on the back. Available as a T-shirt or a Sweatshirt. Comes in Ash-Grey, White or Natural.